Bringing the Charles Thompson Askew family into the present day requires more research than I am prepared to do. Because of privacy concerns, the information available online for people presumed to be still living is somewhat limited. And rightly so! Here is what I know of the rest of this story. 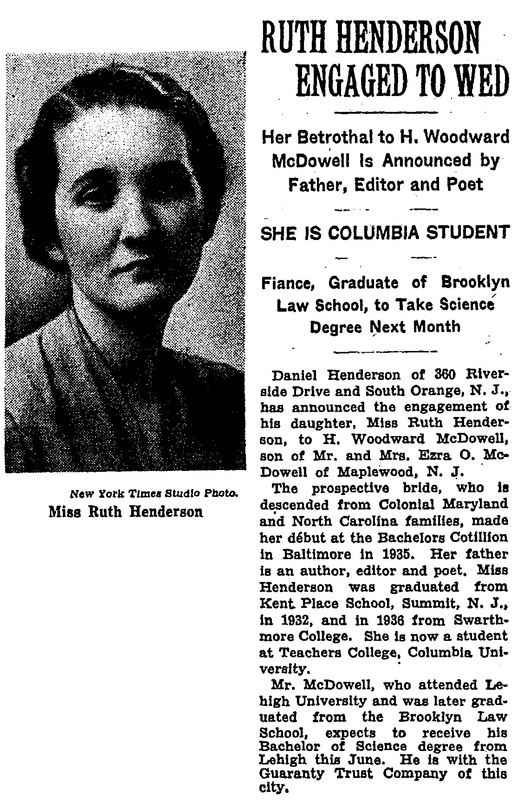 New York Times; published May 2, 1937. Although I have some clues about Ruth and H. Woodward McDowell from news articles which suggest they had two daughters named Nancy and Ann, I cannot prove it at this time. We know from Charles’ obituary that he married a woman whose first name was Edith and that they had a son named Charles. The 1920 federal census record for Sierra Madre, Los Angeles county, California, shows Charles T. Askew, head-of-household, age 61, born in North Carolina; Edith M. Askew, his wife, age 48, born in England; Charles E. Askew, his son, age 19, born in New York. Given all the evidence I have already presented about Charles T. Askew, I have concluded that this record must pertain to him and his family. The last record I have for Charles Thompson Askew is the obituary, published just 3 years after this census was taken. His wife’s maiden name may have been Matthews. The California Death Index lists Edith Matthews Askew, born November 12, 1870 in “other country” and died February 19, 1957 in Los Angeles. His son, Charles E. Askew, can be found in numerous records. The 1930 federal census record for Sierra Madre, Los Angeles county, California shows Charles E. Askew, head-of-household, age 30, born in New York, father born in North Carolina, mother born in England; Freeda I. Askew, his wife, age 24, born in California; Helen E. Askew, his daughter, age 4, born in California; Betty J. Askew, his daughter, age 6 months, born in California. This census also asked for “age at first marriage.” In this case, it gives us some very important information. For Charles, his age at first marriage is reported to be 21 – approximately 9 years earlier. For Freeda, however, her age at first marriage is reported to be 23 – just one year earlier, and too soon to be the mother of Helen who is 4 years old. I suspect that Freeda is his second wife. Can I prove it? The California Birth Index, which I found on Ancestry.com, lists Helen Edith Askew, born in Los Angeles county on July 25, 1925. Her mother’s maiden name is recorded as Vanblack. The California Death Index, also found on Ancestry.com, lists Helen Edith, born July 25, 1925 in California and died May 7, 1996 in Los Angeles county. It records her mother’s maiden name as Vanvleck, her father’s surname as Askew, and her full name as Helen Edith Pennington. Despite the different spellings of her mother’s maiden name, which could easily be due to a transcription error, these records appear to match each other and are consistent with the 1930 census record. Could Vanblack (or Vanvleck) be the maiden name of Charles E. Askew’s first wife? Child of Frank Abram and Eliza B. (Stanbery) Van Vleck: Helen Janette Van Vleck (adopted), born Feb 2, 1904; died at the birth of her only daughter; married in Sierra Madre CA April, 1922, Charles Askew. Child Helen. It appears that Charles E. was married first to Helen Van Vleck and second to Freeda (last name unknown.) Helen apparently died in childbirth. So sad . . . In census records I found Frank Abram, Eliza and Helen. That information together with the Van Vleck family history led me to the book The History of Cerro Gordo County, IA, 1910, which has quite a bit of information about the Stanbery/Stanbury family. It reports that Frank Van Vleck and Eliza Belle Stanbury are living in Minot, ND and that she is the daughter of Dr. and Mrs. William C. Stanbery. The Iowa connection led me to an article published in the Mason City Globe Gazette on October 17, 1957 about a lawsuit that the local power company was bringing against many people who had an interest in land located in the Stanbury Addition, Mason City, Cerro Gordo county. The defendants included Charles E. Askew and Irene Askew, husband and wife, and Helen Edith Askew Pennington! One detail that I have yet to prove is the maiden name of Charles E. Askew’s second wife. The census records list her name as Freeda or Freida I. Askew. Given that the name listed in the news article is “Irene,” I think that may be her middle name. Old high school and college yearbooks are increasingly available online. Here is a photo I found in the 1945 Pasadena Jr. College Yearbook for Helen Edith Askew. What else do I know? From his military registration card, I know that Charles E. Askew’s middle name is Emerson (keep that in mind, it is a name you will see again) and that he had blue eyes and brown hair, and that his birthday was August 18, 1900. He may have served in the US Air Force as a pilot and may have been a volunteer fireman in Sierra Madre, according to various records I have found but that I can’t prove pertain to him. I have not found a death record for him. The California Death Index lists Freida I. Askew, born October 17, 1905 in California, died September 10, 1975 in Los Angeles. I haven’t been able to find any records for their daughter, Betty. Next, we will return to the east coast at the end of the 19th century and follow one of Charles T. Askew’s brothers.